It’s been so long! I SURVIVED. I say that only half-jokingly–there was a time when I literally thought I wasn’t going to make it. It was a close call, guys. I didn’t sleep much. Ate a lot of granola. Cried a lot, screamed a lot, etc. Now, I’m paying for abusing my body with a fever and so much achey soreness that I am almost completely unable to move any of my limbs. At least now that I’m home I have my bed and an endless supply of tea to nurture me. After finals, moving out of my apartment, and getting home, I can finally relax. 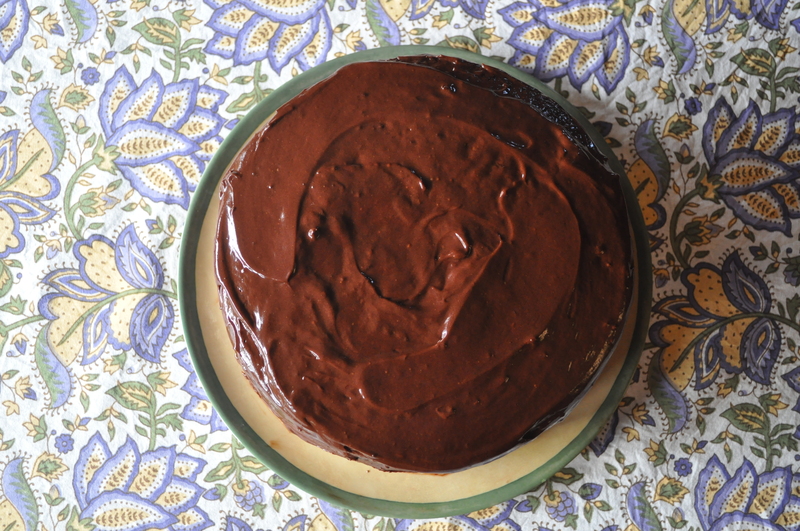 My family is happy that I’m home–both for baking/cooking reasons and for other me-being-home reasons. When we’re not screaming at each other, that is. Standard family shenanigans. Obviously I needed to bake something immediately when I arrived to take full advantage of my family’s FULL-SIZED and FULLY-STOCKED kitchen (what luxury). I’ve been stressed. Baking is my stress relief. 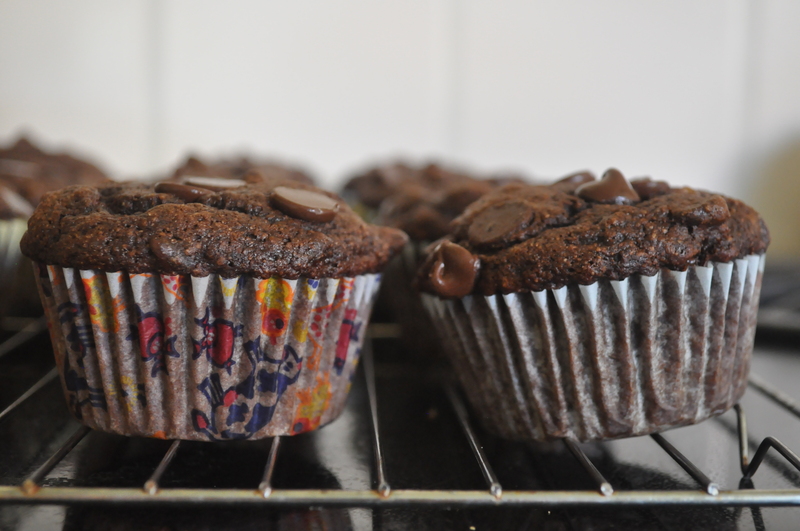 It was only a matter of time before I went cooking/baking crazy. I was actually pretty proud of these cookies. 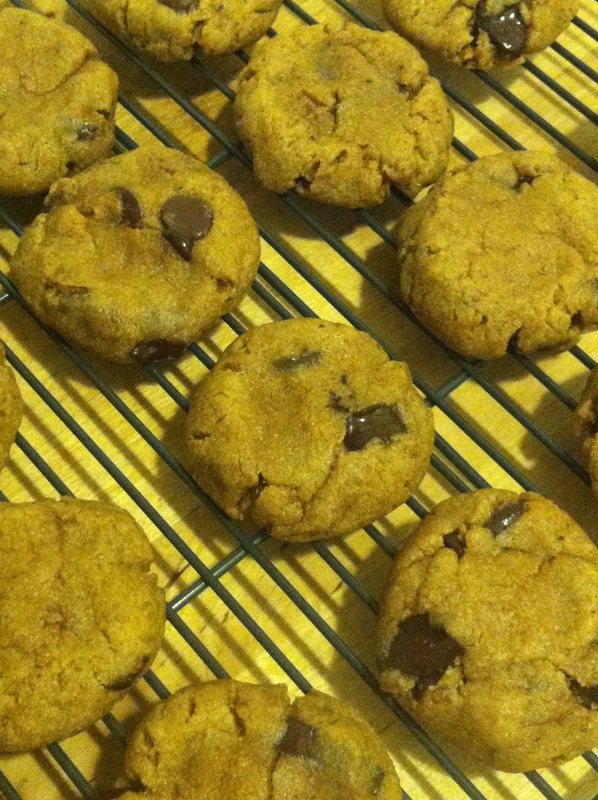 My lovely friend Cheski came over and helped me bake and I just kind of made up the recipe as we went along. They turned out great. 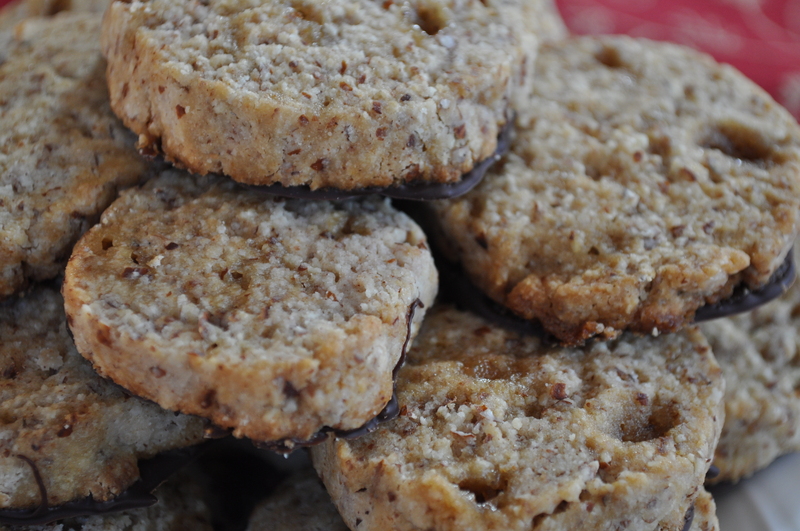 A little crumbly, but that’s shortbread for ya. Combine your flour, almond meal, baking powder, cinnamon, and salt in a bowl. Set aside. In a separate bowl, whisk your egg until it gets a little light and fluffy (you don’t need to meringue it by hand, just until the yolk and white are fully combined and it expands a little). Whisk in the melted coconut oil, vanilla, and honey. 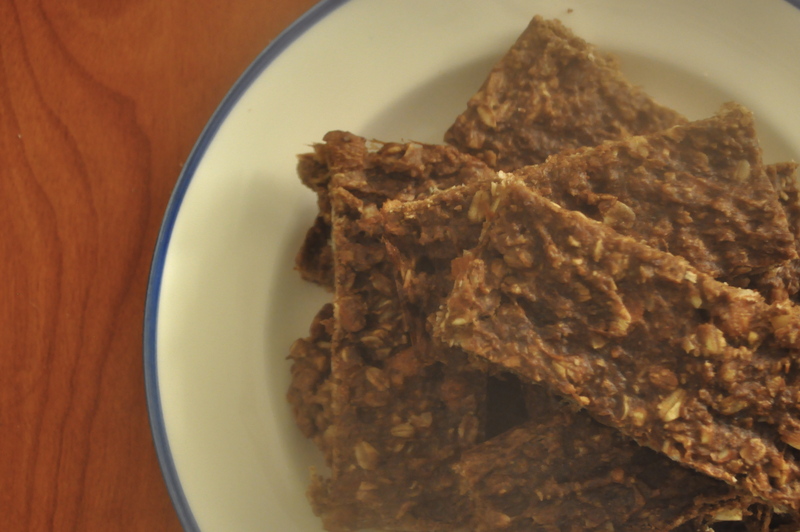 Pour the wet ingredients into the dry ones and fold until just combined–the mixture should be a little crumbly. Form into a ball in the bowl (if you want to use your hands for this part, by all means, go for it) and stick it in the fridge for at least 30 minutes. When you stick it in the fridge, preheat the oven to 350. After you remove your chilled dough from the oven, roll into a cylinder in wax paper. With a sharp knife (to avoid crumbling), slice your cookies about 1/4″ thick like those terrifying but wonderful slice-and-bake holiday cookies you buy at the store. 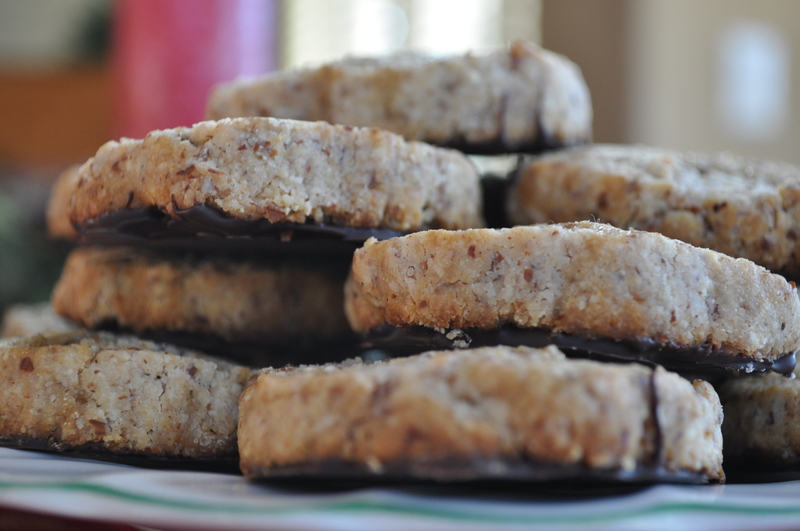 Place on a lightly greased cookie sheet and bake for 15-20 minutes until the edges are lightly browned. Take them out and let them cool for a few minutes on the cookie sheet before very carefully transferring them to a cooling rack. 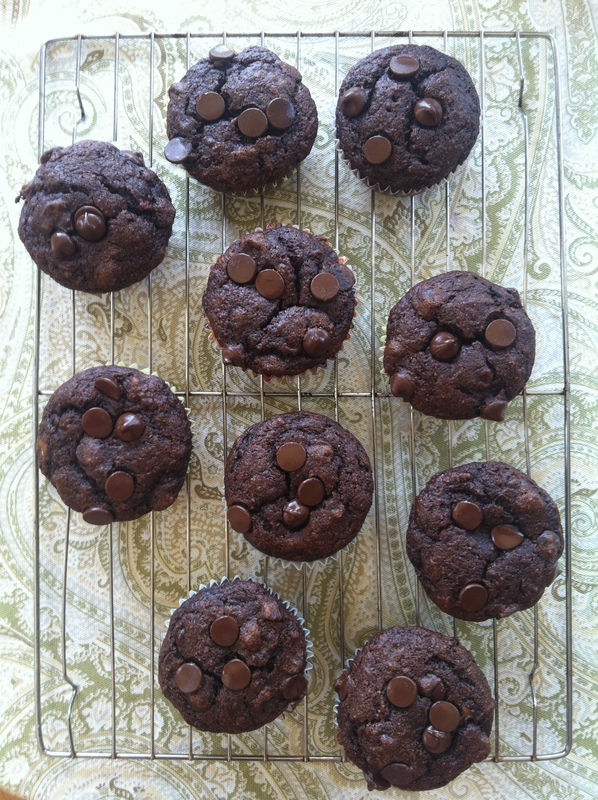 Melt your chocolate chips in the microwave, stirring between 30 second intervals until fully melted. Use a spoon to spread a thin layer onto the bottom of your cookies once they’re cool enough, place on a cookie sheet lined with wax paper, and refrigerate until they’ve set. Aren’t they beautiful? I highly recommend eating these with tea or coffee. They’re like little tea biscuits! They make me feel proper and British. Kinda. 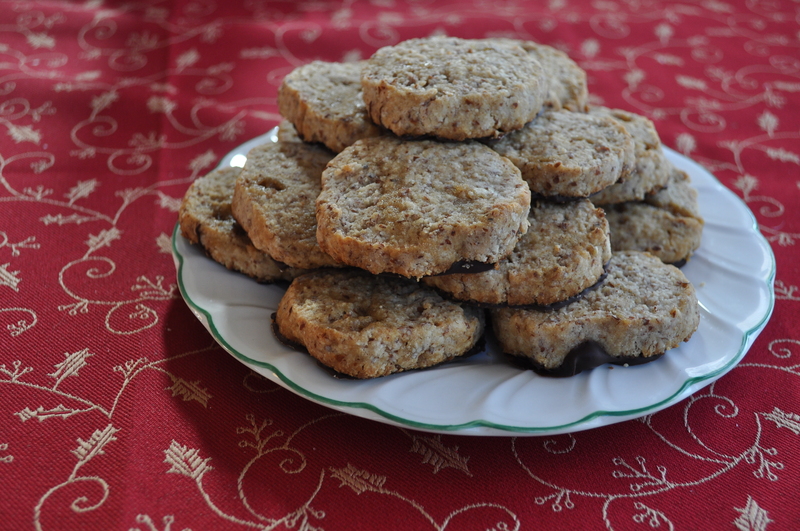 These are nice, simple holiday cookies without overdoing it on sweetness. I recommend ’em! More holiday goodness to come, I’m sure. Just you wait. Categories: Dessert | Tags: almond, black bottom, chocolate, cookies, shortbread | Permalink. Okay hi. I know it’s been a while…I’ve been busy! Kinda. Maybe just lazy. Sooooo anyways today was my dad’s birthday. 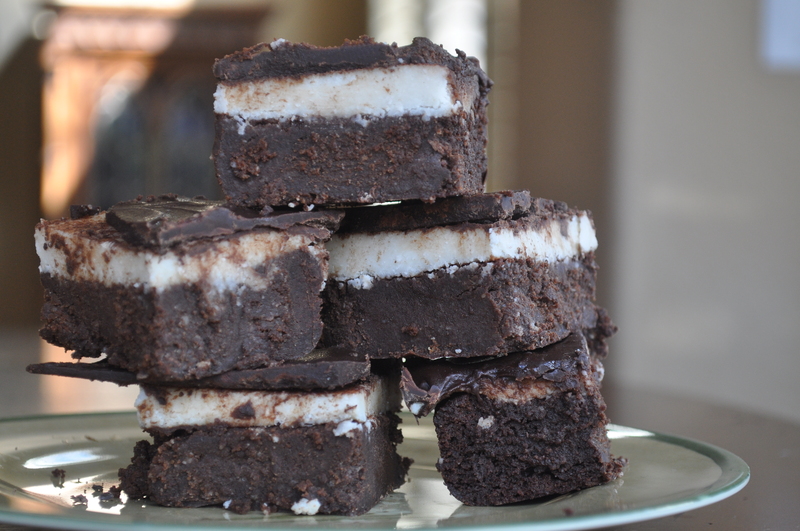 As you know from my Father’s Day flourless brownies post, he loves chocolate almost more than life itself. 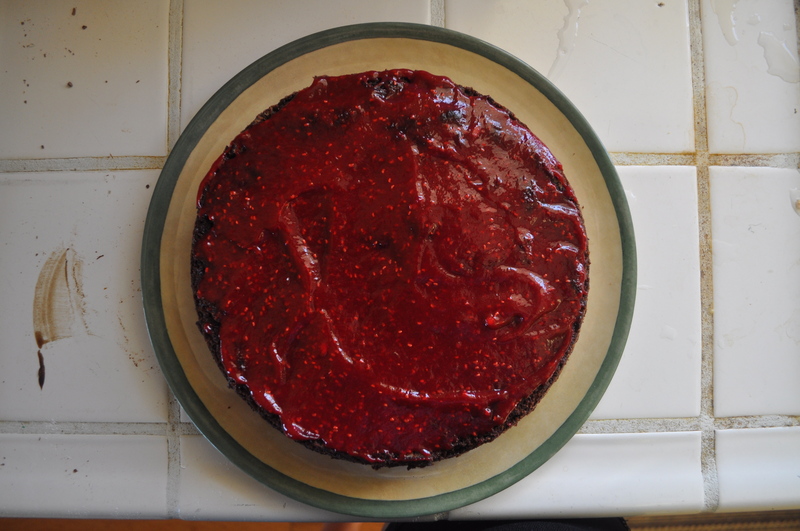 So naturally, I made the darkest chocolate cake I could find with rich chocolate frosting and a raspberry filling. Ummmmm yes. It just as good as it sounds, maybe better. Okay, it took forever. Like, literally hours. (As if I was doing anything else today…lalala) But it was soooo incredibly worth it. I would absolutely make it again. Regardless of the blood, sweat and tears that were involved. Okay maybe not blood. 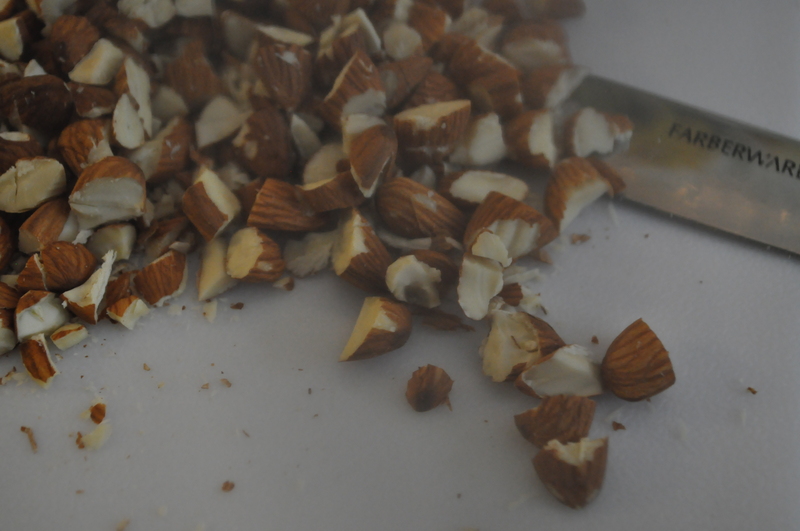 But there was certainly sweat (chopping chocolate is HARD and it was HUMID, okay) and there were almost, kinda tears. Okay so just sweat. My point is, it took a long time and there was a lot of “doing” involved. As in, taking care of three separate recipes. ALL IN ALL this was a lot of work, but I did appreciate the outcome. 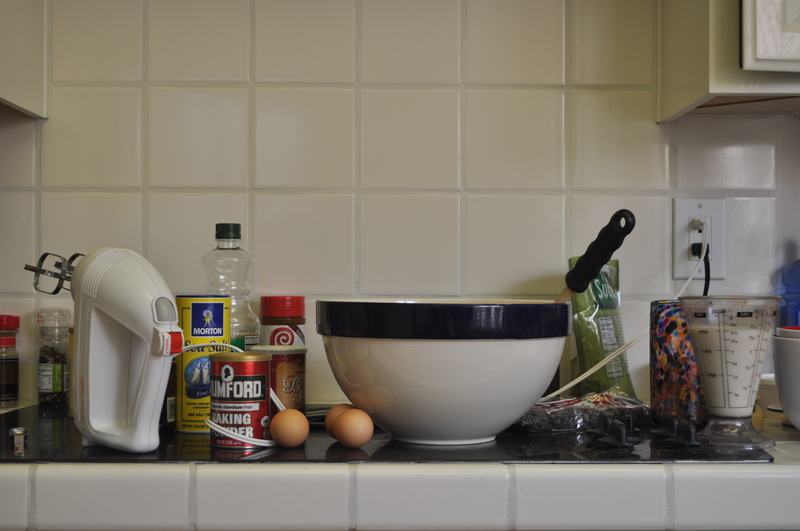 Heads up: prepare yourself for a lot of cake preparation pictures, I got a little camera happy. I was working on this all day, after all. This cake was my pride and joy! First of all, grease and flour three 9″ baking pans. I only had two 9″ ones and two 10″ ones, so I had to wait for the first two to come out and cool before I could do the last one. But that’s beside the point. If you have three, lucky you! In a large bowl, mix together the dry ingredients. Add the eggs, milk, oil, and vanilla and beat with an electric mixer until smooth. Afterwards, stir in the boiling water by hand. Since I had to wait for the first two layers to be done before I could even think about the last layer, I had to separate some batter so that I only put boiling water in the portion that I was just about to bake. I eyeballed about a third of it, put it in a separate bowl, and set it aside. 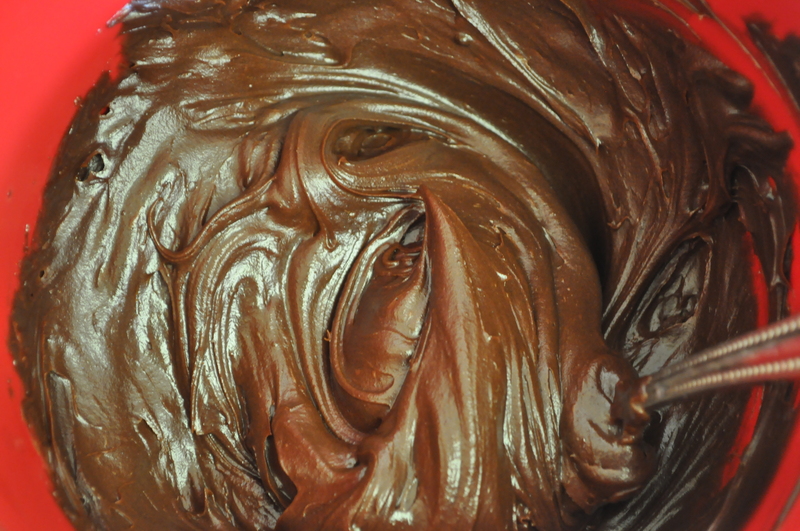 After you mix in the water, the batter may seem like it’s a little too thin. It’s not! I promise! I was worried too (I mixed in about 1/2 c. per layer) because it seemed like it was a little too runny, but the cake turned out great, so the boiling water clearly does something right. Bake for 30-35 minutes (32ish was perfect for me) and let the cake cool on a wire rack. 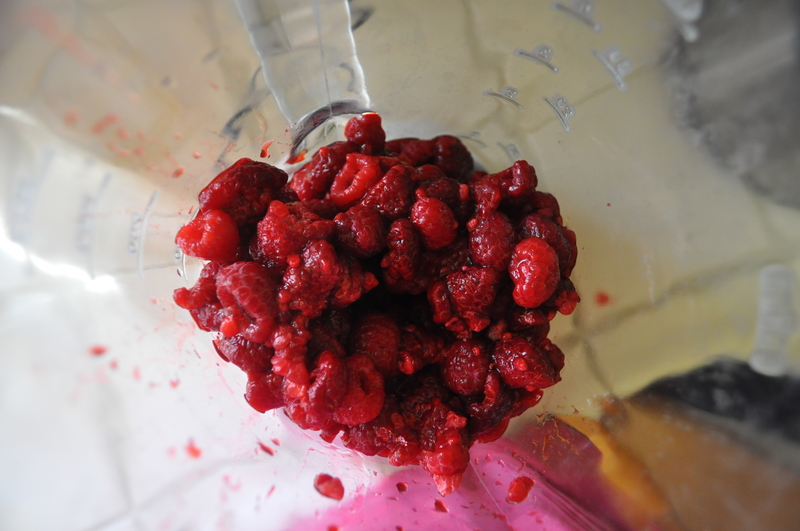 Puree the berries in a blender, food processor, or whatever gadget you happen to have that chops/blends/purees. Strain the puree into a saucepan (to remove as many seeds as possible) and add sugar and cornstarch, heating over medium heat until it comes to a boil, stirring constantly. 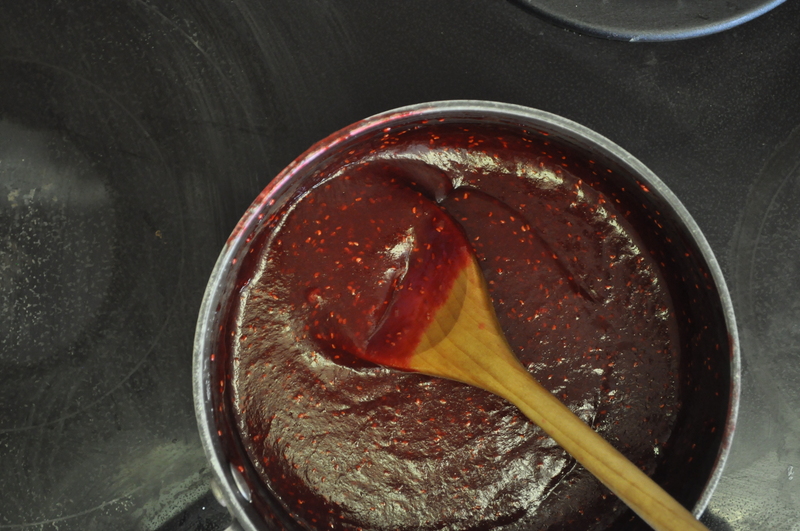 Once the mixture thickens, take it off the heat and let it cool. Heat cream, sugar, and honey over medium-low heat until it comes to a boil, whisking until the sugar is completely dissolved. 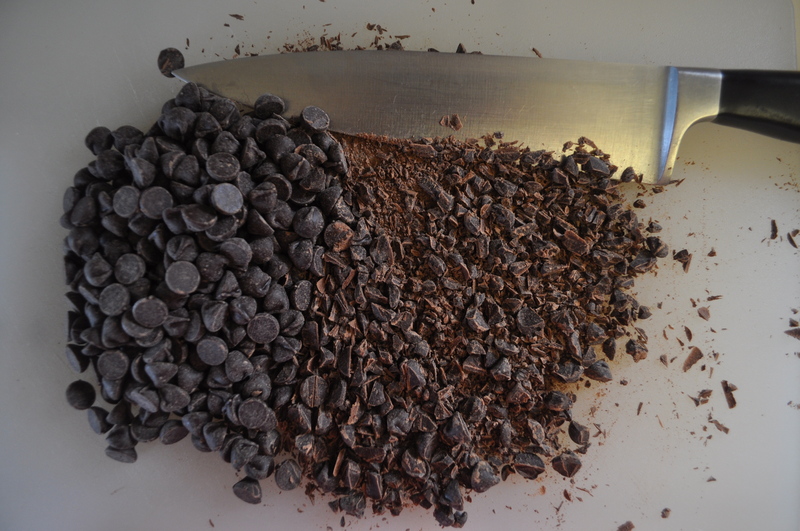 Remove from heat and add the chopped chocolate, whisking together until the chocolate is completely melted and the mixture is smooth. Cut the butter into pieces and add to the pan, stirring until the butter is melted throughout. Transfer the frosting to a separate bowl so it can cool, stirring occasionally. In order to speed up the cooling process (since, of course, I am extremely impatient), I stuck the bowl in the fridge for a few minutes, pulling it out every once in a while to stir. Don’t leave it in there too long or the frosting will harden too much to spread! 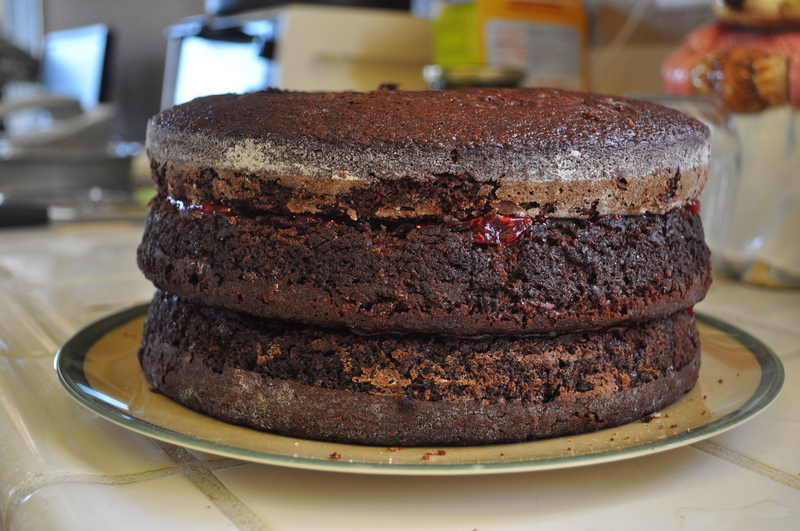 Once the layers are out of the oven and cooled, put them on top of one another with half of the raspberry filling spread between each layer. 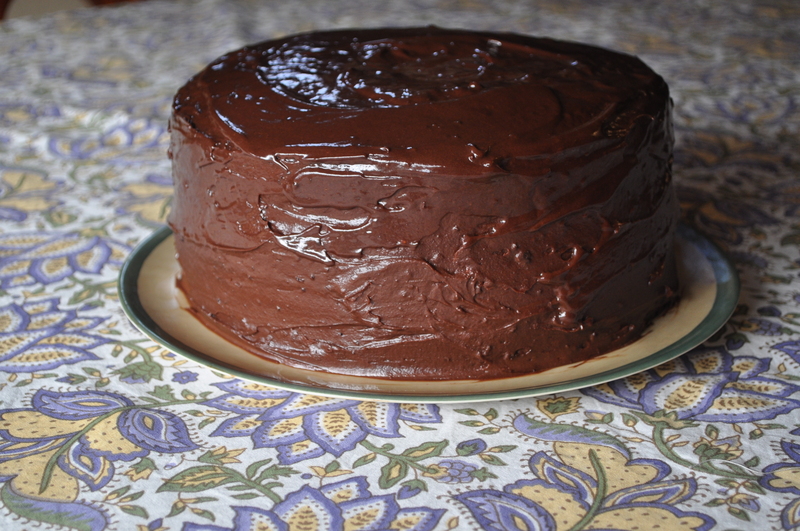 Cover the whole outside of the cake with the beautiful chocolate frosting (it should be juuust the perfect amount) and there you have it! A beautiful, triple layered masterpiece. 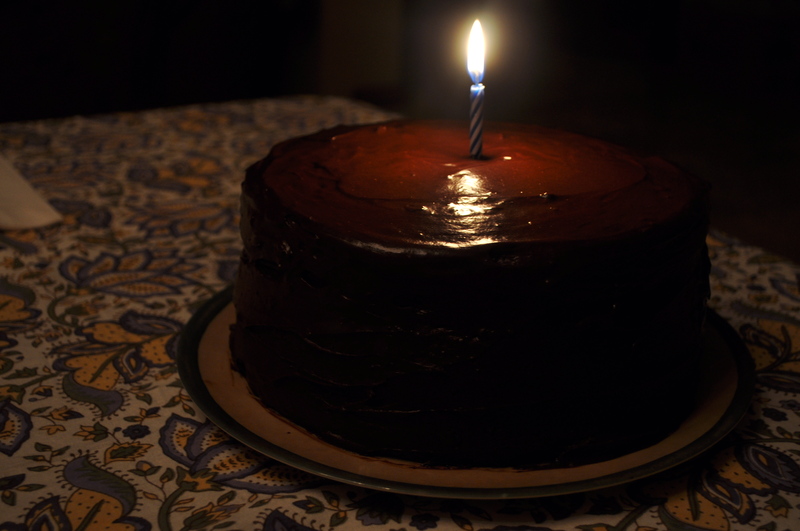 Happy birthday to yooooou, Dad. Categories: Dessert | Tags: birthday cake, chocolate, chocolate cake, dark chocolate, dessert, raspberry | Permalink. Bon appetite! And make sure to pour yourself a glass of milk. 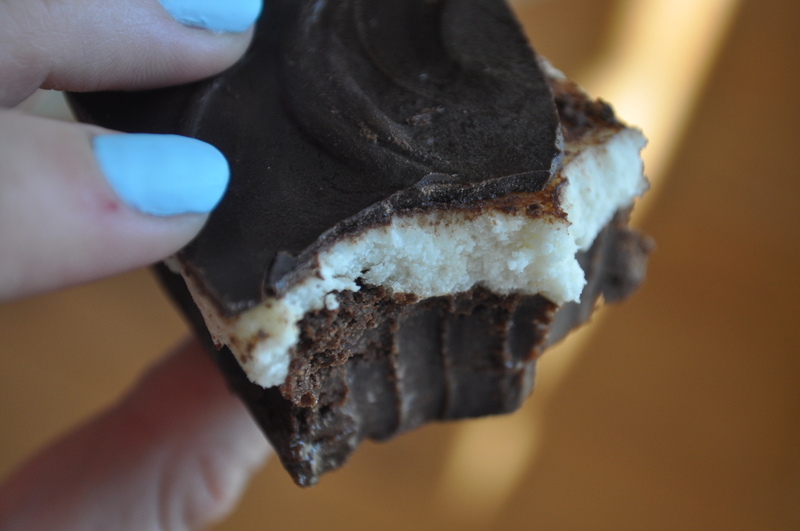 I’m not joking when I say these are CHOCOLATELY. 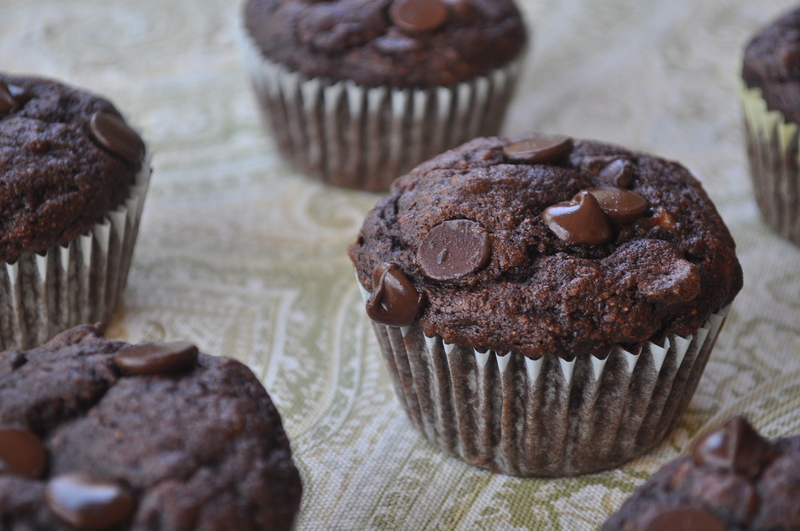 Categories: Dessert | Tags: baking, brownies, chocolate, flourless | Permalink.